People want to know how I stay as productive as I do. They want to know how I publish so much, create so many things, and also how I stay sane doing it. To be completely honest, I didn’t always have a good answer to the question of how I do what I do. Sometimes, if I’m being truthful, I’m kind of amazed that I’m able to produce these things too. So, for the past several months, I’ve been on a journey to try and figure this out. I had been feeling like I had a lot of energy, but that it wasn’t always going in the right direction. I was being productive, but it didn’t always feel meaningful. I began by working with an experienced coach. And then I reflected — a lot. I spent most of that time thinking through different possibilities for defining my “why,” my “how,” and my “what” (inspired by Simon Sinek’s work). The question that really helped me to figure things out was this one: when people want to work with me, or when they become fans of my work (whether that be my podcasts, books, coaching, etc.) what are they drawn to? In other words, I wanted to know what it was that made me magnetic. When I asked this question, and after much thought and much reflective writing, everything unlocked. It’s that I trust myself. In a very deep way, and with an incredible amount of consistency, I trust that I can do the things that I set out to do. This is what helps me get out of my own way. I think it’s also what creates a level of confidence that draws other people to me and my work. I’ve named this practice radical self-trust and I’ve defined it as one’s capacity for steadfast self-awareness and self-loyalty. These are the “what” of radical self-trust. And these are the benefits that anyone can get if they practice it. Then, I got to thinking about the “how” of radical self-trust. What do I do to cultivate radical self-trust in myself, and — maybe most important of all — what are the ways that I help other people to cultivate radical self-trust? When you do these things, and especially when you do them consistently, you get the benefits of radical self-trust. Once I figured out this framework, a lot of puzzle pieces started fitting together for me. I began to see that this was the strand that was tying all of my work together. I also began see how I have been building toward articulating this work for years. I took each of the key phrases from the radical self-trust lexicon (like “meaningful productivity” and “seeking self-knowledge”). Then I made them into categories on my blog and assigned each of the 100+ posts I’ve written for the last two years to one or more of the categories. Everything fit. Every single post. Without any kind of intentional plan, I have been diligently writing about these topics and ideas for the last two years. If that doesn’t give you chills, I don’t know what would. It turns out that I have also been podcasting about these topics for the past couple of years as well. Altogether, it’s been a lot of practice and reflection on a topic that I didn’t even have a name for yet. Now, I’m planning to share this framework in a range of ways. I’ll be talking more about it in the weeks and months to come through different mediums such as writing and podcasting. And you’ll see that I’ve merged my podcasts into the Radical Self-trust podcast channel as a method of making this new focus even more transparent. I think you might be surprised at how little the content of my podcasting and writing will change. It’s just called something different now. And it has a lot more meaning for me. If you know me at all, you know that I’m process-focused and systems-oriented. I like to break things down so that I can see how they function. My ultimate goal is always to share a process or system that’s worked for me with other people in a way that they might find helpful. Given this, it probably won’t surprise you at all that I’m putting together a group coaching program to help others cultivate radical self-trust in their own lives. 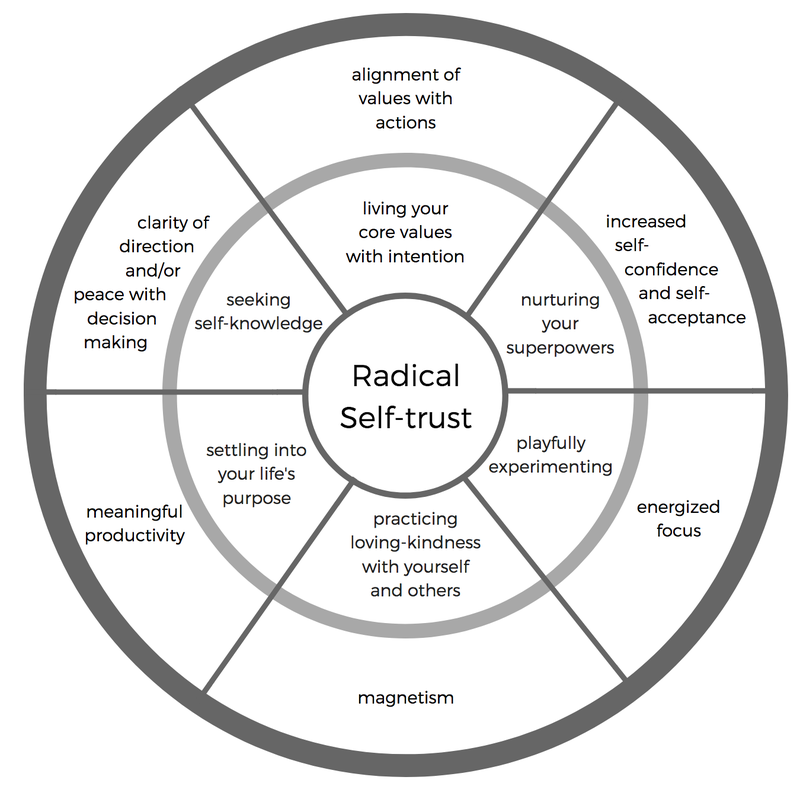 While radical self-trust looks a little different for everyone, I’ve found that the framework is nimble enough to allow for that flexibility. So, radical self-trust is now officially my thing. It feels a bit big, and a bit scary, and a bit like my life’s purpose. And I am so ready for it. How do you cultivate radical self-trust?